WhatsApp’s latest 2.18.30 update has been released for iOS devices on the App Store. The new update for brings features such as location and time stickers, which are quite similar to the stickers one can add to Instagram stories. 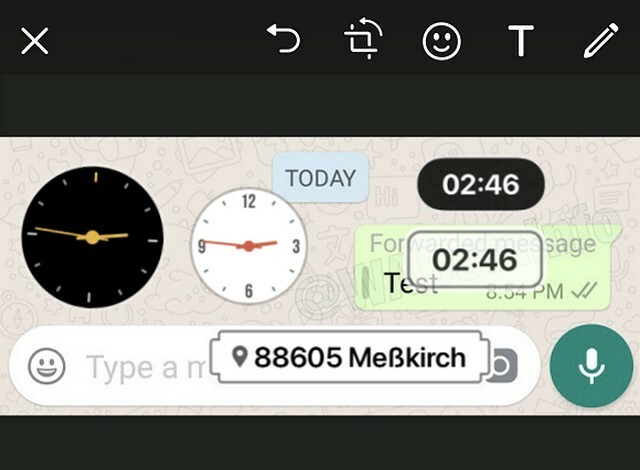 “WhatsApp has finally enabled the time and location stickers. Tap the smiley icon when editing a photo, video or GIF!”, reads the update’s official changelog. Details of the stickers were spotted in a previous WhatsApp update (v2.17.50) on iOS, and it has finally been enabled with the latest update. The location and time stickers appear to be the only new change arriving with the update. However, an analysis of the update’s code by WABetaInfo suggests that WhatsApp’s team is working on some advanced features like spam alerts, the ability to download data report from WhatsApp servers, etc. WhatsApp has reportedly been working on a way to tackle the menace of spam messages, and one of them involves reporting a contact which sends out spam texts on a frequent basis. The latest WhatsApp update suggests that in later versions, a ‘Forwarded Message’ tag will appear above a message in the text bubble to alert users if it has been forwarded from another conversation. In accordance with the EU General Data Protection Regulations, WhatsApp will soon roll out a new feature that will allow users to download a data report from WhatsApp servers. The report will give users an insight into the data which is used by WhatsApp. 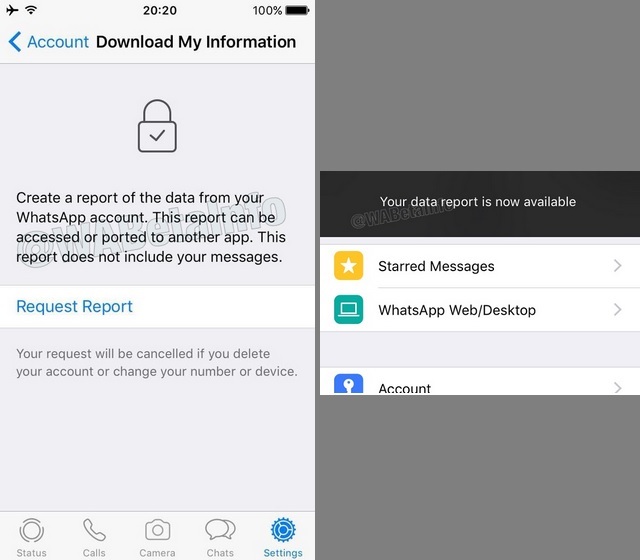 An option called ‘Download my Data’ will be added to the Account Settings section in the app, and tapping on it will let users request a data report. Once the report is compiled, users will be notified to download it. 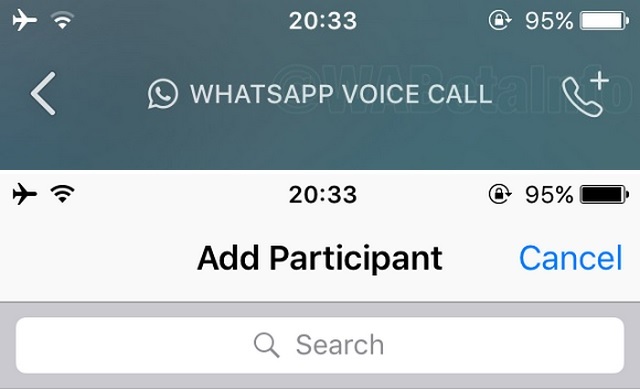 The ability to make group voice calls is expected to arrive on WhatsApp’s iOS client soon. Users will see a new dialer logo with a ‘+’ sign that will let them add participants to join their group voice call. 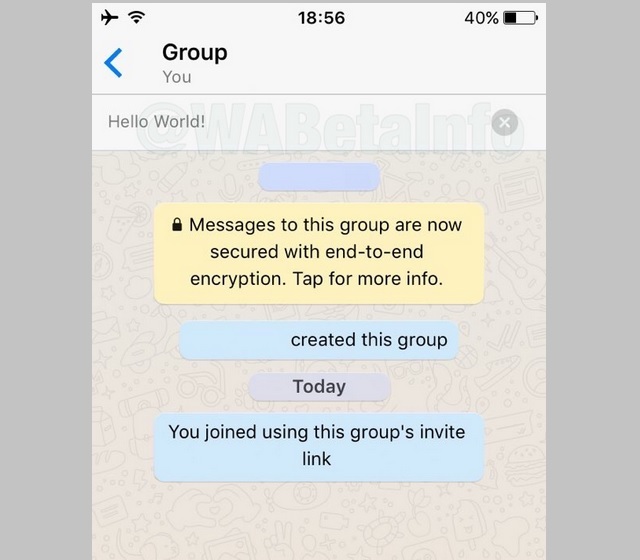 Additionally, users who enter a WhatsApp group will see a pinned box that will describe the way they joined the group viz. a group invite link or added by the group admin. The features described above, except the time and location stickers, are all in the development stage, and it is not clear when they will arrive via a stable update.